Handpicked Astonishments is Paul Harris's new concept for teaching the cutting-edge magic on a wide variety of topics. The concept is simple. Rather than try to teach every variation or idea on a topic, he curates. Put simply, these are the absolute BEST five or six effects possible on each topic. No filler—just the ultimate routines you can perform with thumbtips, loops, the Invisible Deck, and card forcing. Volume 2 is dedicated to the wide world of card forcing. Joshua Jay will share with you a variety of forces for every occasion: in the hands, on the table, on the go, or with a setup. Then, he shares several new, unpublished routines utilizing the forces taught, as well as three mind-blowing classic of card magic that should be in every magician’s repertoire. Want to read reviews? Click here for a bunch of them! I just finished watching the first volume of this Handpicked Astonishment series (Thumbtips), which I absolutely loved! Now it's time to move onto the card forces. I must admit that I love CARD MAGIC above all else. I always have. So I was particularly looking forward to reviewing this one. Because this is a separate review, I do need to repeat myself a little (in case you haven't yet checked out my other review). Joshua Jay is fantastic. There's just something about his presentational style which is very inviting, and easy to learn from. You don't have to go, "Wait a minute....what the heck did he just do? Where's that rewind button!" Nope, not here. His teaching is clear and concise, and everything is covered beautifully from multiple angles. Another thing I liked about this DVD: it's not just a collection of tricks or routines. In fact, Joshua goes into detail about principles that you need to know, like SELLING THE FORCE and the psychology behind it. For example, he covers how to make a person (who picked a card YOU FORCED on him) begin to believe that they THOUGHT of the card (as opposed to picking it). It's subtleties like this which are invaluable, and well worth the cost of the DVD. Anyone can learn a "move", but to learn the psychological mechanics behind it (and how to make the spectator THINK something happened when it really didn't) is such a powerful thing. In addition to executing forces, Joshua covers such topics as MISDIRECTION. In other words, he doesn't just say, "First you do this....then you do that. BOOM, forced card." Instead, he talks about using timing and certain words/gestures to create misdirection which naturally plays into the force. He covers forces from the TOP and BOTTOM of the deck, so you will be able to use the right one that fits what you're looking for. One of the things I LOVED is when Joshua imparts little bits of knowledge that you never even thought about before. For example, you may not realize it, but when you TURN AWAY your head to show a spectator a card, you are psychologically conveying to them that you have no idea what this card is, nor do you want to know. Hence, you're looking away. That's something you may do naturally, but you may have never stopped to think, "Wow, you're right! Just by looking away, I can take the heat off the force because it subconsciously instills in the spectator's mind that this card is not known to the magician." Another thing Joshua does (especially with the Slipcut Force) is he CORRECTS a lot of mistakes that other magicians do. He trims the fat, and gets down to the bare bones of how to perform it correctly. Bottom line: I loved this DVD. For card magic, it's always good to know multiple ways to force a card. 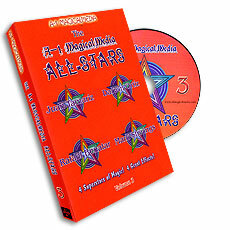 Whether you're new to card magic, or you're a working pro, I think you will find value in this DVD. Beginners will love the easy instruction, and professionals will love Joshua's thoughts and background behind the motivation of the force. Best of all, you can DOWNLOAD THIS VIDEO today, and begin watching it as soon as your order is processed. Why wait for something to ship when you can access it online?